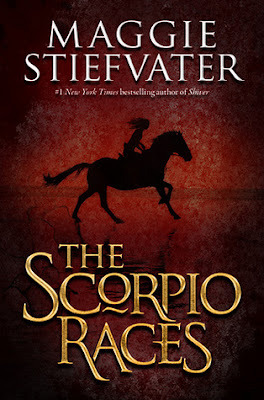 Maggie Stiefvater's The Scorpio Races has been bandied about in the media as the next big young adult novel. I've bought into the hype on other acclaimed YA novels and ended up disappointed, so I picked up a copy with caution, preparing to be let down. As it turns out, The Scorpio Races is the next big young adult novel. It is thrilling yet tender, harsh but brimming with love. After a leisurely start, it races to a breathless finish, and its compelling characters and vividly realized setting are brought to life with lyrical writing. Every November, the island of Thisby hosts a deadly race where riders mount capall uisces (pronounced CAP-ple ISH-kas), fearsome water horses with a wicked taste for flesh. Training for the race as well as the event itself claim the lives of riders every year. And as the book begins, bold Puck Connolly finds that the only way she can keep her splintering family together is by registering for the race. Trouble is, no woman has participated before, and not everyone on the island wants that to change. Meanwhile, Sean Kendrick, a four-time winner of the race, finds himself with more at stake in this year's race than just his life. It should come as no surprise that Sean, who is wild and lonely and just a little magical himself, finds himself drawn to the fierce Puck, and she him. For all that the book features terrifying, flesh-eating horses from the sea and culminates in a wild, deadly race, not much happens in the novel. Puck trains her horse and worries about feeding her family. Sean strikes up an acquaintance with a rich tourist. Both characters fret about money. In fact, the book spends more time with Puck and Sean going about life on Thisby than it does on the race itself. This is not a criticism of the book, however. Stiefvater has created in Thisby a realistic evocation of the workaday struggle to survive in a small, isolated place. Her descriptions of the ocean, the cliffs and the smell of salt in the air make the setting real for the reader, as do the working men and women who inhabit it. What brings the book to life is the way Puck and Sean both scramble to carve out a living. They both grapple with the question of what happiness looks like, and how to catch it and keep it. Part of the tension in the book comes from knowing that both Puck and Sean need a first-place finish in the race to meet their goals. Even more tension comes from knowing that there's no guarantee that one or both of them will survive race day. The end of the book rushes at you like a sea-maddened capaill uisce, and as eager as I was to learn the outcome of the race, the final chapter comes far too quickly. It's been some time since I felt such intense longing for a happy ending for the protagonists, and I was reluctant to reach the conclusion of their story. I would never dream of spoiling the book for you, nor will I tell you whether the tears I shed in the final chapters were joyful or sorrowful. Read this book, and discover its pleasures for yourself. One note: The Scorpio Races features scenes of injury and death to animals. (And people, too, but monster that I am, those scenes don't bother me nearly as much.) I find such scenes almost unbearable, yet they didn't take away from the power of the book or my desire to finish it. Thanks for the review - I think I'll have to move this one up the list! Beautiful review. This was one of my favorite books this year. Thanks, buttrflysky! I'm looking forward to picking up Stiefvater's other books as soon as possible.